Evidence shows that foreclosures are continuing to decrease all across the nation. In January Fannie Mae did a survey to discover the National attitude regarding housing, the market and specifically buying and selling real estate. Sixty-seven percent of American adults responding to Fannie Mae’s January National Housing Survey said now is a good time to buy a home, the company reported Monday, while 44 percent said now is a good time to sell. Both figures are up from December, when positive responses were at 64 percent and 40 percent, respectively. Doug Duncan, SVP and chief economist at Fannie Mae, said the country’s current economic momentum played a role in January’s more upbeat views of the housing market. The share of respondents in Fannie Mae’s survey who said their household income is “significantly higher” than it was a year ago climbed 4 percentage points to a survey high of 29 percent, the company reported. Looking ahead, 48 percent said they expect their finances to improve in the next year, also a survey high. Overall, 44 percent of Americans said they believe the economy is on the right track, an increase of 3 percentage points and only a few points less than those saying the economy is headed the wrong way (49 percent). That optimism spurred 66 percent of those surveyed to say they would buy a home if they had to move, a jump from 61 percent at the end of 2015. The share of those who would rent, meanwhile, slipped after three months of gains, falling to 29 percent. “Overall, these are good signs to start off 2015 and are consistent with our expectation that strengthening employment and economic activity will boost the speed of the housing recovery,” Duncan said. One thing that is sure to bolster this new confidence, is the spring market. Locally we are seeing an increase in listings and buyers, a relief after the severe slow down during November, December and January. 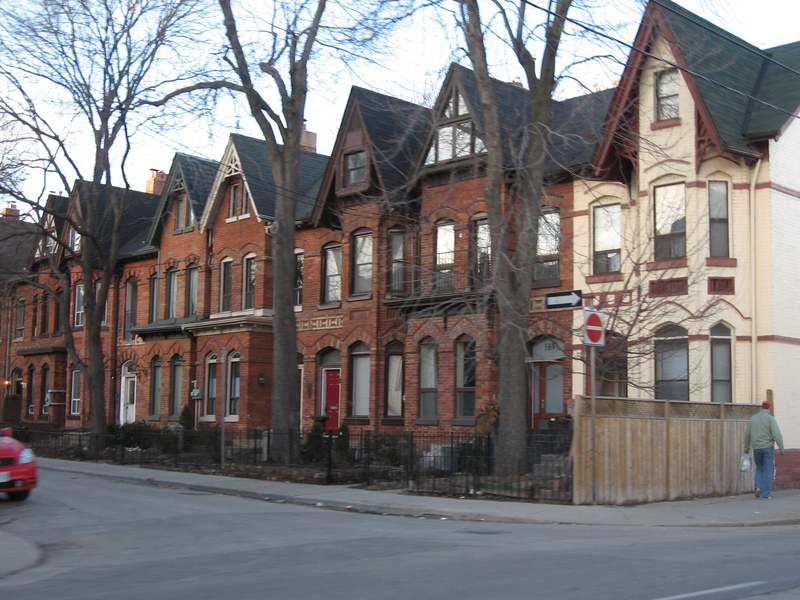 New, Tighter Mortgage Rules: Who’s Squeezed Most? Finally, someone in Washington is recognizing that the vast majority of homeowners hit with this housing foreclosure/short sale crisis were the victims in all of this. Yes they defaulted on their payments, but almost always there were extenuating circumstances. More often than not they were sold a loan that the lender knew was the wrong product but sold it anyway and when anything when financially wrong – health, job, divorce even death – they were in trouble. I am glad to see that they will allow those that re-establish their credit scores can re-apply for homeownership after 12 months. In order to be eligible for the more lenient approval process, provided documents must show “certain credit impairments” were from loss of employment or loss of income that was beyond their control. The lender also needs to verify the income loss was at least 20 percent for a period lasting for at least six months. CONSUMERS BEWARE- Foreclosure Rescue Scam Targets Defendants In Foreclosure Cases. Investors have significantly reduced their home purchase activity in recent months, prompting divergent trends among property types. The non-distressed market continues to be strong, according to the latest Campbell/Inside Mortgage Finance HousingPulse Tracking Survey results. The average numbers of offers and sales-to-list price ratios have increased in recent months while average time on market for non-distressed properties has declined. Non-distressed properties received 2.3 offers in May, based on the three-month moving average, the third consecutive monthly increase for the metric. “Still really short of inventory to show my buyers and we face multiple offers with people willing to pay over the appraised price of the property,” according to a real estate agent in California. Average offers on non-distressed properties vary by region, with Arizona, California and Nevada leading the country. Non-distressed properties in California received 4.1 offers in May, based on the three-month moving average. 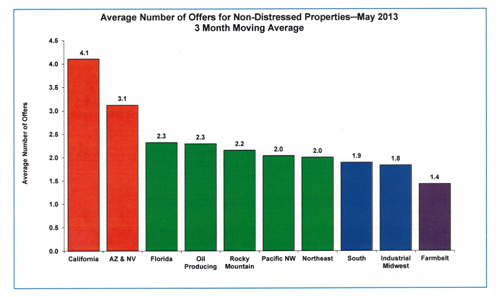 Non-distressed properties in Arizona and Nevada received 3.1 offers in May, based on the three-month moving average. Properties in Farmbelt states of Iowa, Kansas, Minnesota, Nebraska, North Dakota, South Dakota and Wisconsin received 1.4 offers in May, based on the three-month moving average. Properties in the South and Industrial Midwest also averaged fewer than 2.0 offers in May. Sales-to-list price ratios on non-distressed properties increased for their fifth consecutive month to 97.6%, based on the three-month moving average. Properties in the West again outpaced the national average. In California, the sales-to-list price ratio was 99.8% in May, based on the three-month moving average. “List prices in most cases are now simply the opening bid for an auction,” according to a real estate agent in the San Francisco area. Properties in the Northeast and Industrial Midwest had the lowest sales-to-list price ratios at 96.0% in May, based on the three-month moving average. “We have not seen the huge jump that some major cities have, however, if the house is priced right it will sell for very close to asking price,” according to a real estate agent in Missouri. And time on market for non-distressed properties declined for the third consecutive month to 9.2 weeks, based on the three-month moving average. Time on market for non-distressed properties in California was 4.2 weeks in May, based on the three-month moving average, while non-distressed properties in the Farmbelt, Northeast and South averaged about 12.0 weeks. Trends for distressed properties diverged from non-distressed properties in May as some investors have switched business strategies from buying properties to selling them. Investors accounted for 20.2% of home purchases in May, based on the three-month moving average, down significantly from a peak share of 23.1% in February. The number of offers on real-estate owned properties and short sales declined in May compared with the previous month, based on the three-month moving average. 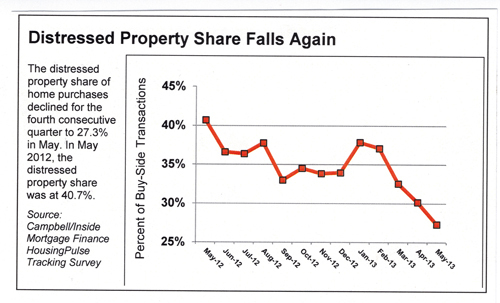 Sales-to-list price ratios also declined on short sales and damaged REO properties. And time on market increased significantly for short sales while staying relatively steady for REOs in May compared with April. 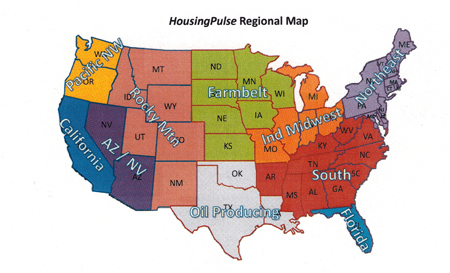 The Campbell/Inside Mortgage Finance HousingPulse Tracking Survey involves approximately 2,000 real estate agents nationwide each month and provides up-to-date intelligence on home sales and mortgage usage patterns. The Wall Street Journal carried an article today about a further real estate decline predicted by Meredith Whitney. Much of her analysis is based on the larger American cities hit hardest by the mortgage melt down, which of course led to the foreclosures that brought real estate prices to their knees. Despite her dire predictions, many analysts feel there is a marginal recovery in the market now and if as she suggests unemployment climbs, the drop will be significantly less than her 25% prediction. Meredith Whitney a well known banking analyst feels the real estate market is in for another major shock, part of a cycle of tumbling home prices and escalating unemployment which she says could plummet another 25%. Since here in Montana and other cities in the United States the real estate market is showing some signs of stabilizing, that is a pretty depressing prediction. Sales while slow have been gaining steady growth over the summer but dropping prices in other states will have its impact nationally and that would mean that mortgages can be higher than a home is worth in today’s market. This is untenable especially with declining employment statistics and someone in the household loses their job. The cycle continues with those unemployed being unable to make payments losing their home to foreclosure, putting more distressed homes in the market, which in turn drives prices down even more. The only bright side is that these lower prices are bringing buyers out looking and finding bargains. Housing bubbles grew in Las Vegas, Los Angeles and many other American cities – unchecked for several years and now those cities have experienced a severe down market bringing prices down by as much as 50 per cent according to the S&P/Case-Shiller index. New construction – unrestrained in the boom years has left neighborhoods desolate and abandoned. Slight improvements are showing up in the statistics in that prices fell less in the second quarter than in the first by 4.2%. This is the first positive comparison in three years. Some cities like Denver Colorado and Dallas Texas have consistent positive comparisons for the past 12 months. Many analysts feel Meredith Whitney’s doom and gloom forecast is not reasonable given the positive comparisons this quarter. A Real Estate Market Comeback? Maybe. Signs are sprouting in unusual places that perhaps the real estate market is finally on the rebound. Are there enough details and statistics to back this up? Or is this just more rhetoric hoping to boost confidence in the housing sector? Washington this week said that home sales rose last month as buyers took advantage of the depressed market. Economists were quick to say this is a clear sign the market may finally be bouncing back. Buyers have been taking advantage of the bargain basement sales with home prices being forced down by the huge foreclosure market. And first time buyers are jumping on the band wagon to take advantage of the federal tax credit. From the undersecretary of Commerce "The U.S. Bureau of the Census released new residential sales for June 2009. Sales of new one-family houses rose 11.0 percent in June, well above the rise of 2.3 percent expected by private-sector analysts." The stats say these purchases have pushed the home sales to a high not seen since last November. Then go on to say that home prices are still falling around the country. What gives? Another article pipes up to say sales have risen for three months in a row, and new construction is moving ahead into their busiest season since last fall. "The worst of the housing recession,"said David Resler, chief economist at Nomra Securities, "is now behind us." "But the recovery in the overall economy, is likely to be slow and arduous" he said. How can all of these conflicting comments make sense? In a jumbled way they do. The real estate market as we all know has been hit tremendously hard by the foreclosures. This has driven the average price for a home down. Unfortunately, those who must sell their homes are forced to sell at these rock bottom prices established by the foreclosures. These factors then creates an environment where home buyers are motivated to buy. So the cycle continues with more sales that are driving the prices down, certainly not contributing to any increase in value for home owners. Locally, last week in the newspaper, it was noted that developers for the first time this year are starting to pour concrete for new housing. This is a good sign that they have some confidence in the market recovering. But even though the real estate market appears to be starting a recovery, it does not mean it is going to turn around and become a powerful economic engine anytime soon. 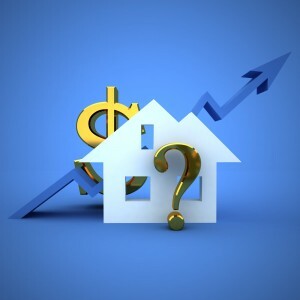 The term real estate investing in all probability makes you think of a number of things like hard money, real estate portfolios and real estate retirement plans, and then you may expand to thinking of short sales, bulk reo investing or virtual real estate investing. You may also consider what roles these things play in your life as a real estate investor in different economies. 1. You will always end up with a positive yield when you take on real estate investing education. You can create thousands of dollars in potential wealth with each real estate deal. Knowing about getting that wealth is the key in the end to your success. Learning as much as possible about real estate will increase your odds of success whenever you do a real estate deal. A small investment in your education can yield big results when you use that learning. There are many online courses, your local MLS can point you to training and NAR the National Association of Realtors can also advise you about real estate education. 2. You can succeed in real estate investing regardless of the state of the economy. Many people think (wrongly) that you can only succeed in real estate when the economy booms. In reality, poor economies are great for real estate investors. You will likely find properties that you can buy at deep discounts. Additionally, you may find deals that would not exist in a booming economy. In fact, real estate investing can turn the tide for a poor economy. When the economy is not thriving, short sales, bulk reo sales and virtual real estate can all thrive. You can save yourself and others from major financial woes if you know how to do these deals. 3. You do not need to have a great deal of money if you want to be a successful real estate investor. You can succeed in the real estate investing arena no matter how much money you are working with. There are lots of transactions that you can perform with other people’s money. Private lenders will lend you their money if they think you are a good investment. A good investor will know as much as they can about real estate in the current market. This will help you represent yourself as a solid prospect to private lenders who do not know how to make money in real estate. Real estate can generate a great return on your investment, knowing when to buy, when to hold and when to sell are critical to your profits. You can create income regardless of the economy. Using your knowledge of real estate investing, short sales, bulk reo sales and virtual real estate you will be able to create wealth for yourself. RISMEDIA, August 6, 2009-Given the current foreclosure situation throughout our country, now, more than ever, is an opportunity for real estate professionals. The sales of homes for less than the amount owed the bank, known as “short sales,” have been widely viewed as an alternative that could help slow the foreclosure epidemic. In theory, delinquent homeowners escape a mortgage they cannot repay. So far this year there have been 8 single family home SHORT SALES sold this year in Coconut Grove. The average length of time between the day these homes came on the market and the day they closed was 9 months. Get FREE $150 Home Valuation! We would like to express our appreciation to Sherry Fields for the expert service we received while selling our home in Missoula. We have sold other properties prior to this with other agents and were not nearly as satisfied. We highly recommend Sherry Fields with Berkshire Hathaway and would definitely have her as our agent in the future. We called Sherry Fields on an affordable foreclosure in town, and to our surprise she offered to meet us on a Saturday morning to show it. It was one of many Saturdays, that she graciously spent with us on our search for “Home.” I’m sure it’s no surprise that on a small budget, our options were limited and not all that great. We tried to be realistic about what we could afford, and put offers in on several houses that did not pass inspections. After a year, and the third house that we walked away from, we knew we had exhausted not only ourselves, but our options as well. Sherry didn’t give up, though. Eventually, Sherry found us a real gem. A very large historic home in the heart of Stevensville; WELL within our budget as it was a foreclosure. . Sherry handled it all, with great skill and professionalism. The moment Sherry handed us our keys was a very proud one for us. . We simply cannot thank Sherry enough for her services! It goes without saying that if you are in the market for a home, you need only make one call. We were very happy with the service Sherry provided. She was very knowledgeable about all aspects of our real estate transaction and made the purchase go smoothly. Sherry was also very helpful with referrals to retail stores, a veterinarian and contractors services for our new home.